A network of walking tracks throughout the park make it possible to enjoy gushing waterfalls, vibrant spring wildflowers, Aboriginal rock art and breathtaking views of the majestic sandstone mountain ranges that are the Grampians. The Grampians are home to more than 900 native plant species and over 200 species of birds and mammals, some of which you’ll find nowhere else in the world. Keep your cameras ready as you’ll have the chance to encounter kangaroos, koalas, emus, wedge-tailed eagles and more. The small picturesque township of Halls Gap, located in the heart of the Grampians National Park, is a great place to base yourself in order to experience an incredible range of adventure activities. It is also home to the Brambuk Aboriginal Cultural Centre where you can learn all about the fascinating relationship the Aboriginal people have with this region traditionally known as Gariwerd. There are many Aboriginal rock art sites located in shelters throughout the 167,000-hectare park. 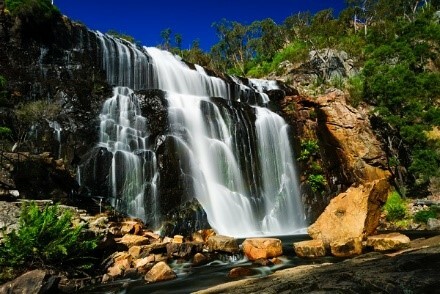 A trip to the Grampians wouldn’t be complete without a visit to at least one of the beautiful waterfalls in the area. MacKenzie Falls is the one of the largest and most magnificent waterfalls in Victoria, boasting a scenic viewing platform that offers awe-inspiring views of the hill ranges and nearby waterways. There are loads of wonderful walks to be enjoyed in the Grampians from gentle strolls such as the half-hour MacKenzie Falls Lookout Walk to multi-day hikes such as the Grampians Peaks Trail. The national park itself has over 50 different walking trails. There are lots of fabulous picnic areas in the Grampians where you can relax, enjoy the bird life and take in the serenity of this stunning natural environment. There is a vast array of picnic spots, making it possible for you to eat a packed lunch in the middle of the forest, right near cascading waterfalls, or in extremely remote settings. Enjoy all of this and more on our Day Trip to the Grampians National Park. Our Grampians Day Tours are designed to showcase the extraordinary natural beauty of this region, comprising plenty of scenic stops where you can breathe in the eucalyptus-scented air and immerse yourself in this western Victorian wilderness.